Offshore fishing for Albacore Tuna is the latest craze to hit the BC coast and we are the pioneers who got it all started! Having written two published articles on tuna fishing, Mike Kelly and the Tides and Tales crew began targeting these exciting game fish back in 2006. 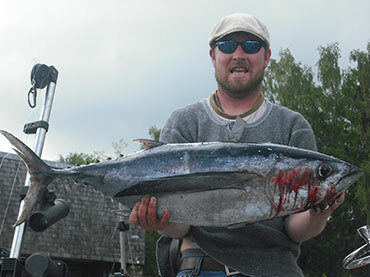 Catching the interest of anglers up and down the coast each time we landed with Albacore, this fishery has taken off and has serious anglers dreaming about heading offshore in search of a ”longfin” or two. Albacore or Long fin tuna as they are also known, are a highly migratory species. Albie’s spawn in tropical waters and travel north with warm water currents, feeding off the coast of Canada and the US in the late summer before heading south again. The schools arrive off Quatsino sound in late August and stay until late September where they are accessible during good weather conditions. 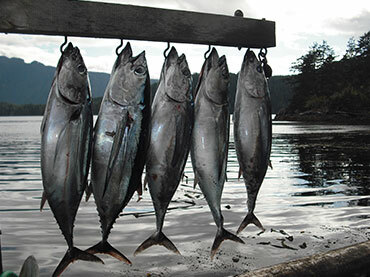 Albacore in Canadian waters tend to be between 10 and 35 pounds, but have reached sizes over 100lbs. They are also known to run in large schools, some several kilometers wide when viewed from the air. 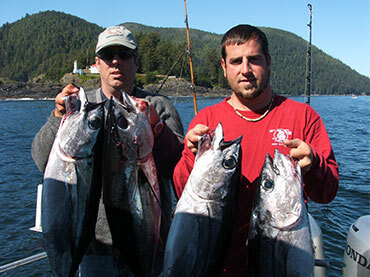 We combine our Tuna trips with fly fishing for Coho salmon, and mixed bag bottom fishing for Halibut, Lingcod and Snapper. These packages are based out of the Eagle Manor Resort in Quatsino Sound and have been a favorite among our repeat clientele. Note: Tuna fishing is for the seasoned angler who is not prone to seasickness. If fishing for Albacore Tuna appeals to you, feel free to give us a shout (1-877-694-3474) and we can discuss the details.